Used for over a million years, we're still not too sure what for, but they must have been good at it to last so long. Most likely they were a multi purpose tool and uses came in and went out. I handled one in a museum a while back that intrigued me, it was made from a pebble rather than a nodule and the cortex of the pebble was left on the back, this made it really comfy in the palm. For a while now I have been planning to try and replicate this one, the main trouble has been finding a pebble large enough. Hand axe sizes ranged from 2.5 inches to over a foot long in extreme cases, the one in the museum was about 4 inches. A couple of weeks ago I started the replication in ernest taking a trip on two different days to the Thames beach pebble hunting and knapping. Each day I collected around 30 viable pebbles and after inspection knapped about ten. I also brought no knapping tools with me planning to use whatever stone I found on the beach. While I was unlucky in my flint pebble hunting I found perhaps the best hammer stone I have ever used. On the first day I gathered around 30 stones for inspection and found about ten viable to try to knap. All but one proved unknappable all either too poor quality stone or so ridden with fractures they shattered when I hit them. This was unfortunate as 3/4 were flat five inch round stones that would have been perfect, however one of these flat 5 inchers proved to not only to be knappable but beautiful quality, it would have made a super hand axe, everything I had wanted except I managed to ruin it by overshooting and hitting too hard simultaneously. So by the end of day I had managed to produce nothing more than a pile of debitage from about ten stones lying on the beach. Next day I repeated my attempt and even refound my hammerstone, not bad after two tides. The debitage had washed away, but some of the stones I had collected but decided not to knap were there. I found another 20/30 stones and knapped around ten of them. Most were useless as day one but two were good. These were only four inches and not too flat so I had to sacrifice some size to thin then, but niether broke. The finished axes are 3 and 3.5 inches long, at the bottom range of hand axe size but still within the range. I managed to acheive my main aim of leaving the pebble cortex on the end, making them comfortable in the palm and easily identifiable as coming from pebbles not nodules. They have already proved their worth perhaps as the most useful household items I have ever knapped. The are killer at opening large parcels, going through tape and cardboard like knives through butter. They have been used to cut rope and string, cut the nylon stuff that keep tags to clothes and drill a hole in leather. No one should be without one, a million years on humanity can't be wrong. very smart, makes you realise how important a good supply of good flint would of been in the past. I too work with alot of beach flint, i'm in Norfolk and although we have alot of coastline to choose from, flint only outcrops on one or two areas. On a usual visit I collect on average around 10 flattish lumps but it takes alot of searching, there are literally millions of flints on the beach but finding the ones that are a good shape and don't go clunk (rather than ping!) when you tap them another stone takes time. I kind of enjoy the search, and so do all the holidaymakers as they wonder what the hell i'm doing tapping rocks and pulling faces and putting ones which make me smile in the rucksack! Then there is the fun task of hauling them back to the train station. I'm not complaining though, there is some top notch flint in amongst all the battered and frost cracked stuff. Happy hunting!! 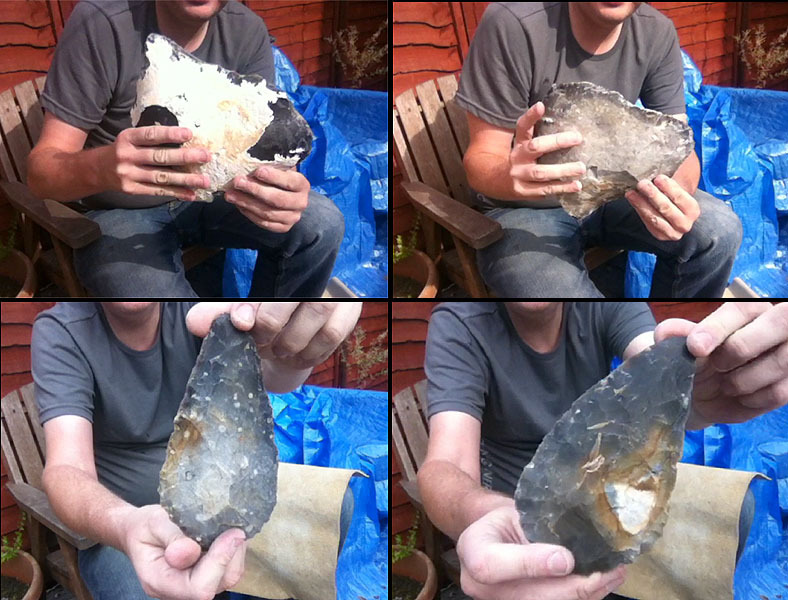 I haven't made a Handaxe for a while, this flint came from a local quarry and I could only take what I could carry. As the nodules where huge I only took two pieces, the larger was destined for a danish dagger (which I broke) and the smaller piece (pictured) I made into a handaxe just to have something to show for my efforts, the flint is not quite the quality I was hoping but being wet and straight out of the chalk made for enjoyable flaking indeed! Now I just need a Mammoth to carve into smaller pieces!! 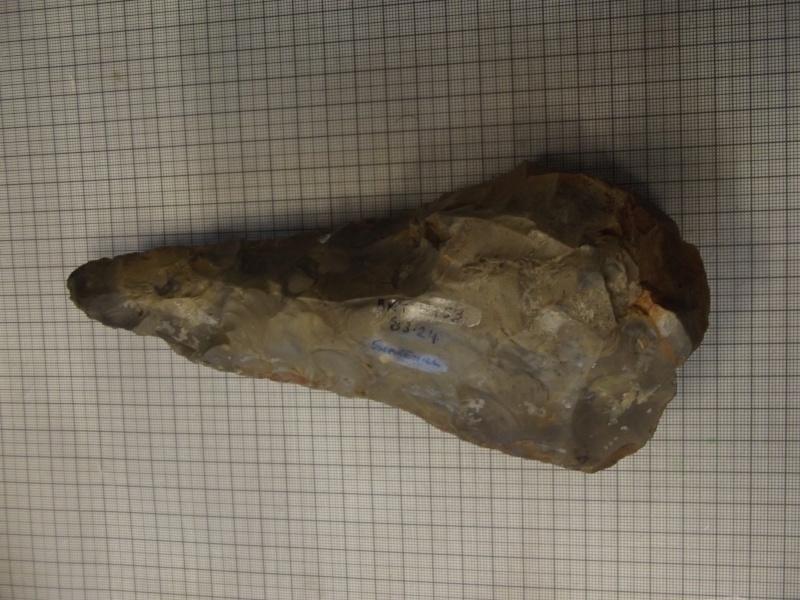 Nice handaxe, almost a Solutrean biface. Kind of a before and after, this said "pointy handaxe please" too me, so I obliged! [img] [/img]Getting down to it with the big bopper, here I stopped to take a photo as I have just removed the long flake from down the middle following the ridge left from the side flake removals, A very useful flake for thinning,essentially a fluting flake. I use this alot in reduction. 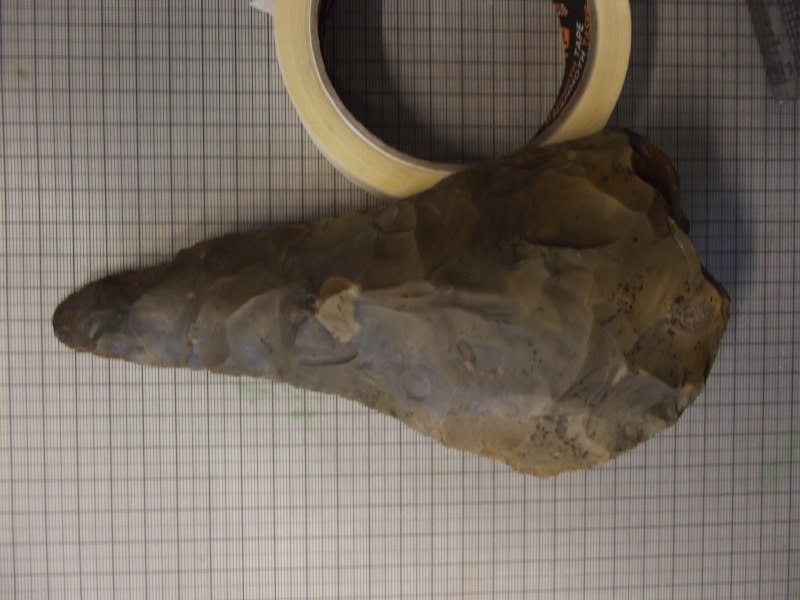 Here's the finished handaxe, pity about the slight hinge and the blind hole but if you have a mammoth to make into smaller pieces this would not worry you! I wanted to leave some cortex on the but I ended up having to knap it all off. [img] [/img]And the side view. I think Homo Hindelbergensis would be happy with one of these, and a few boppers! nice axes - the flint looks very similar to some i got from a quarry just up the road from Swaffam. Has anyone had a go at making a Cleaver here? yet to do so myself. you have been busy after your road trip. Wow! thas a beut! nice colours. 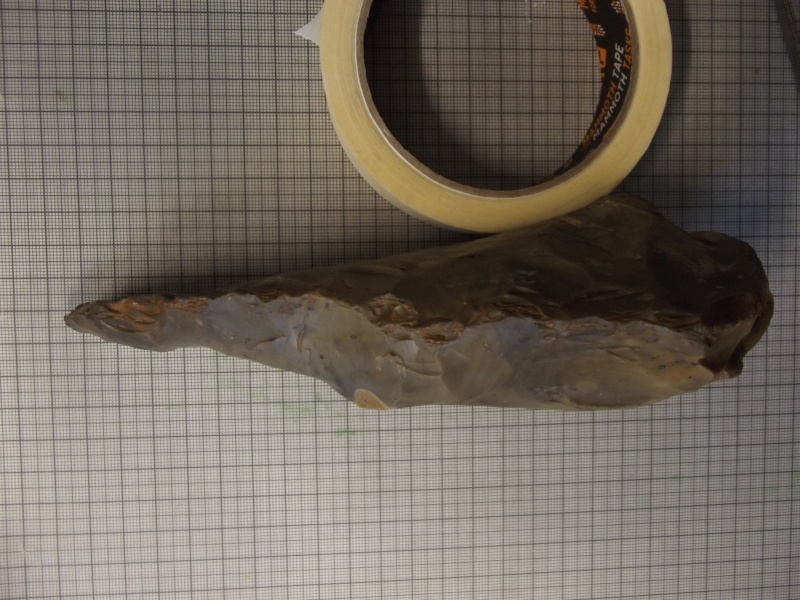 Here's a handaxe on it's way done with sandstone and antler billets. A note about authentic Hand axe sizes: Almost any size is authentic!!! 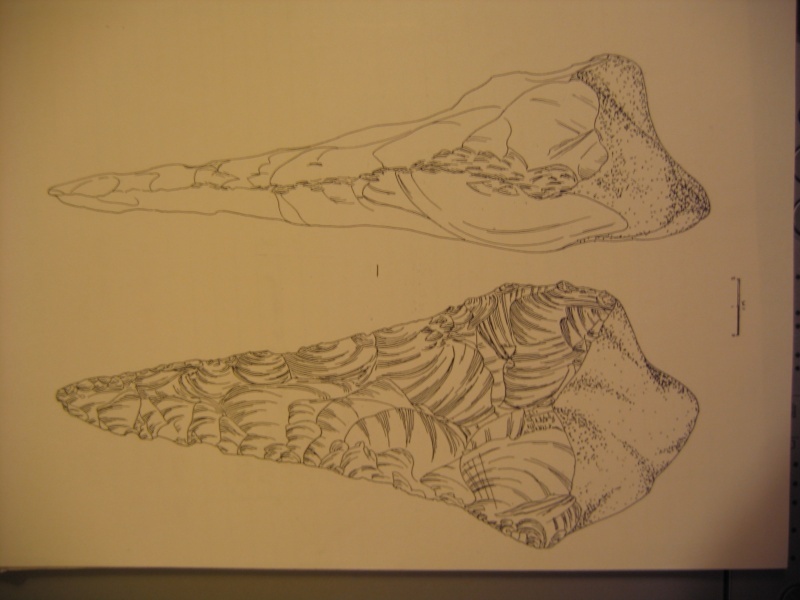 Here is a monster handaxe illustration I found in the files, found in a gravel pit just outside of Norwich. It's 235mm long! (scale at the bottom is 2cm). That's big, reminds me of a report I was reading about Cuxton a few weeks back. 307mm long, they found two i think, these Ficrons can get huge, wonder what they were for? Has any knapper every reproduced one? We like ficrons, we like them a lot! My guess as for function is narrow entry butchery, most hand axes seem to be for making megafauna in to smaller pieces. 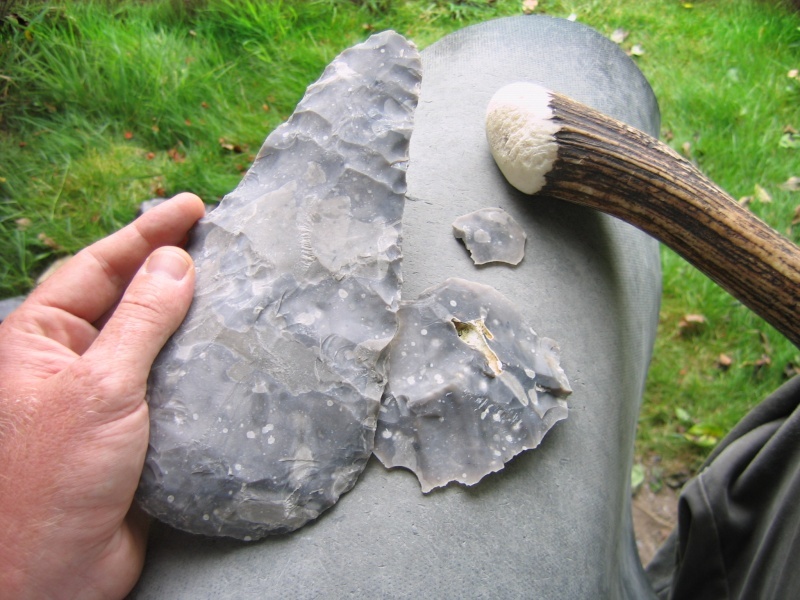 I've had a go at knapping one or two, but not at this scale, you have to be very aware of support as it is easy to break such a long narrow point. This is an old find in Norwich Castle collections, Had to get some photos while it was out.
" 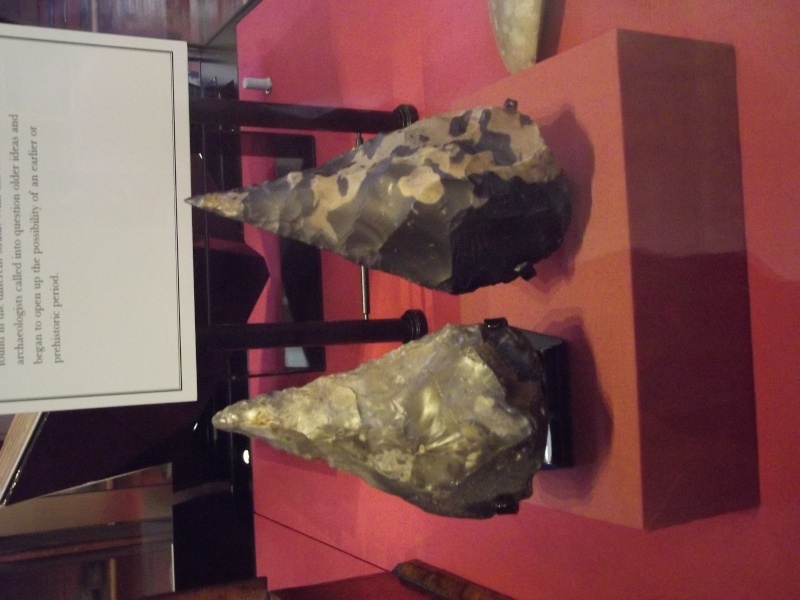 /> These are the the handaxes that got folk thinking that humanity was a little older than previously thought! very sharp tool - I would think they were used when an animal was captured and you went in for the kill. A coup de grace weapon used on a speared dying animal is definitely a possibility and not one I've heard suggested before. could be an original idea.